WOW! *** A RARE FIND IN SUPERSTITION FOOTHILLS! 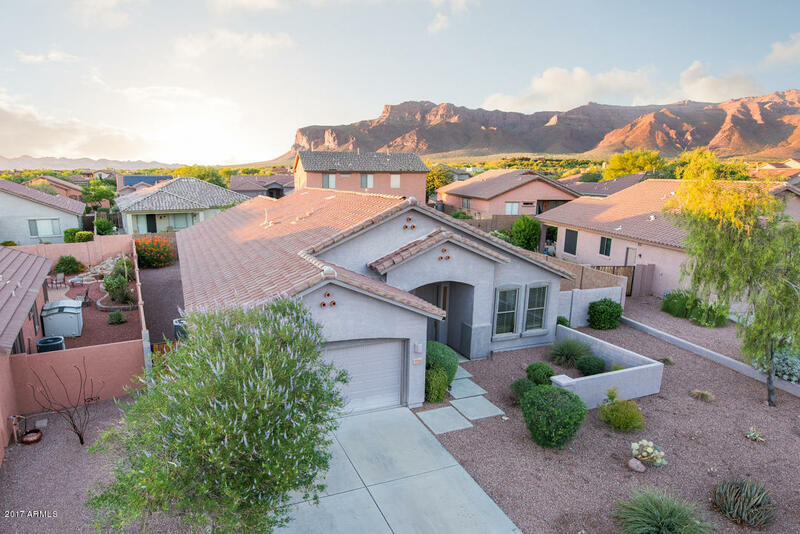 *** on this IMMACULATE, ***LIKE NEW*** WELL PRICED HOME in the beautiful ARROYO VISTA section of SUPERSTITION FOOTHILLS one of GOLD CANYON'S most popular subdivisions! A GREAT USE OF SPACE in this floorplan with ***NEWER AC***EXTRA BONUS/CRAFT room AND LARGE DEN TOO! You'll love the LARGE ENTRY, COMPUTER NICHE, spacious GREAT ROOM, dining area, SPACIOUS KITCHEN includes LARGE ISLAND with PORCELAIN SINK & BREAKFAST BAR! RELAX in the GENEROUS MASTER BEDROOM SUITE with a PRIVATE outside DOOR ACCESS looking out to the FLAGSTONE PAVER patio & serene NATURAL DESERT LANDSCAPED PRIVATE BACKYARD! It's a SHORT WALK TO HEATED COMMUNITY POOL/SPA, PET FRIENDLY PARK and steps away from 52 awesome walking trails...plus walk to shopping and dining too!